Sienna Resources Inc. [SIE-TSXV, SNNAF-OTCBB, A1XCQ0-FSE], said Thursday it has significantly increased its land holdings at the Slattberg cobalt-nickel-copper project in Sweden. 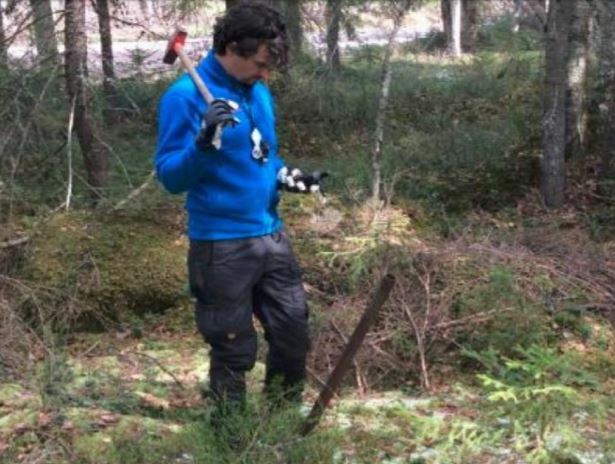 EMX Manager Johannes Holzäpfel marking location of a historic drill hole at the Slattberg Project, Sweden. Source; Sienna Resources Inc. The Slattberg cobalt-nickel-copper project, located 25 km northeast of Falun, now consists of three exploration licenses covering 12,733 acres and at least 16 historic mines, the company said. Sienna is aiming to position itself at the forefront of the battery metals revolution. The company’s main goal is to become a supplier of so-called battery metals, including cobalt and lithium, which are the primary constituents, along with graphite, of lithium-ion batteries used in the production of electric vehicles and to power mobile phones, laptops, and other electronic devices. Sienna’s flagship properties are located on the doorstep of two of the world’s largest lithium ion battery production plants. Those include the gigafactory that Tesla, Inc. [TSLA-NASDAQ] and partner Panasonic Corp. have built in Nevada to support planned production of 500,000 electric cars annually, as well as a similar sized plant that is being built by Swedish battery firm Northvolt in Sweden. Northvolt is expected to locally source as much battery material as possible to feed what is expected to be Europe’s biggest battery factory. It will be built on a site in Skelleftea, in the far north of Sweden near that country’s cluster of mines, eventually employing as many as 2,500 people. Sienna is working to develop the Slattberg Project and the Clayton Valley Deep Basin Lithium Brine project in Nevada, a state which is already home to the only lithium mine in the U.S. — Albemarle Corp.’s [ALB-NYSE] Silver Peak Mine. Slattberg is a historic mining camp hosting cobalt, nickel-copper rich massive sulphide mineralization that occurs within a 2-km belt of historic nickel-copper mines. The project contains drill defined massive sulphide mineralization that extends to a depth of 100 metres and remains open for expansion at depth and along strike. Slattberg is accessible year round, with nearby rail, power and five smelters in the Nordic region. At least 16 historic mines are located on the property with operations dating back to the late 1800s. The new Slattberg exploration license contains four old mines, with one being the historic Martanberg copper mine. It operated in the late 18th and early 19th century. The historic mines are positioned along an east-west trend of massive sulphide occurrences developed in and around a similarly oriented body of Leptite. This is a local term used to describe rhyolitic/felsic tuffacaeous rocks commonly associated with sulphide mineralization in Bergslagen. Mafic and ultamafic rocks occur in and around the mine workings. Sienna is already on the ground in Sweden and expects to be drilling the Slattberg property in early 2018. On January 30, 2018, the company announced that initial results from the ongoing high resolution magnetic surveys in the area of historic nickel-copper-cobalt mines have defined multiple strong magnetic responses along the trends of mineralization. Sienna is fully funded for its upcoming drill program after recently raising $2.5 million in an over-subscribed private placement. On Thursday, the shares eased 1.64% or $0.005 to 30 cents.